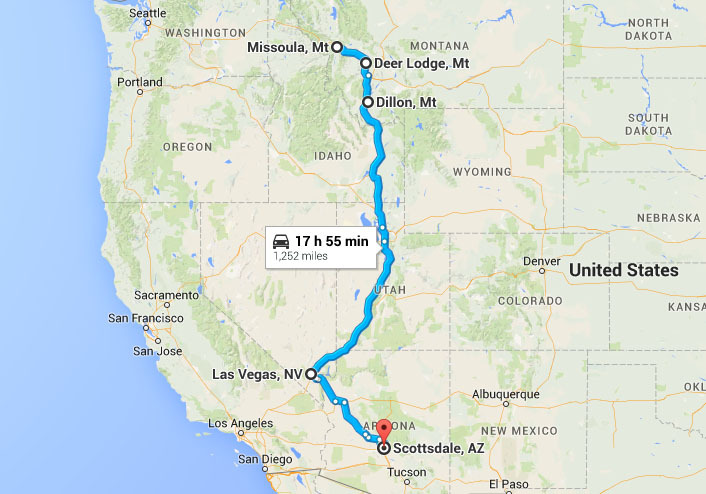 The third and final chapter of last weekend’s 2,600-mile highway jaunt! I peeled open the drapes of room 410 to a stunning blue-sky Montana day last Sunday morning. I now know with a certainty why the state gets its name for being “Big Sky Country.” Dad and I enjoyed a hearty breakfast of blueberry waffles in the lobby of the Comfort Inn in Missoula before firing up the ILX for another mile-filled day. My dad’s been a long-time member of the Rocky Mountain Elk Foundation (RMEF) so we decided we needed to check out the world headquarters just north of town. They had a lot of taxidermied (I’m making up that word) animals on display as well as a small theater and a gift shop where we had to spend a few bucks on T-shirt souvenirs. Leaving Missoula eastbound on I-90, I saw a couple of billboards announcing the “Testicle Festival.” What a name for an event! Apparently this annual tradition in Clinton, Montana draws thousands of people and involves the consumption of animal testicles. I’m serious. Check out testyfesty.com for more information, and book your trip to Clinton for July 29 – August 2 if you want to experience it firsthand! 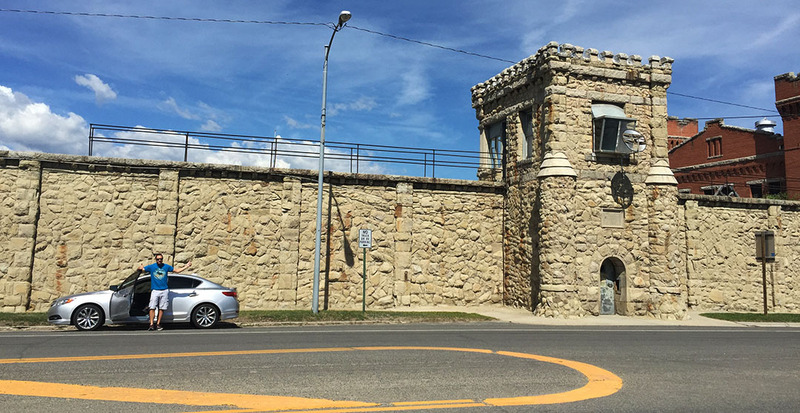 It seems a little odd that we’d want to tour a creepy old prison, but I get a kick out of urban exploration so our next stop was the Montana State Prison in Deer Lodge, right off Interstate 90. 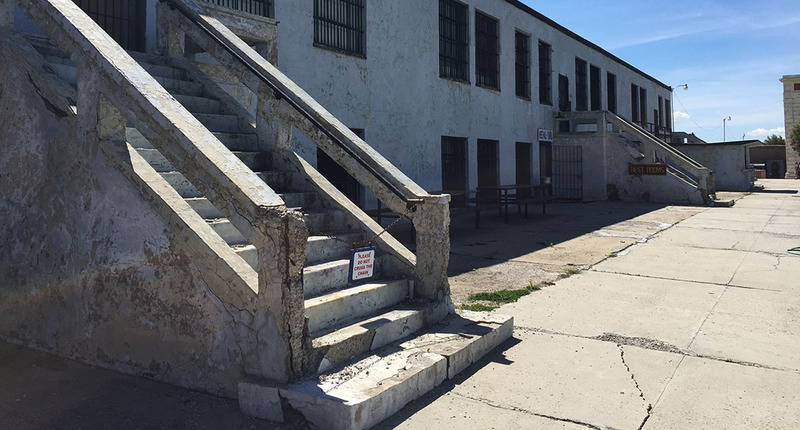 This facility dates way back to 1871 when it was a territorial prison and it served as the primary prison facility for the state of Montana until 1979. It started out very small but was added onto in the decades that followed. Even so, there were constant problems with overcrowding despite the additional cellblocks being added. 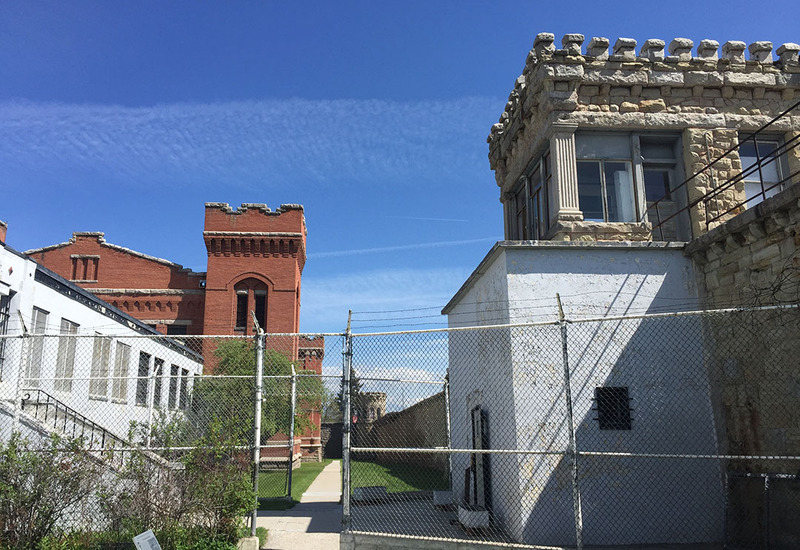 There were 3 riots in the 1950s and a warden was shot in 1959 in an inmate escape attempt. 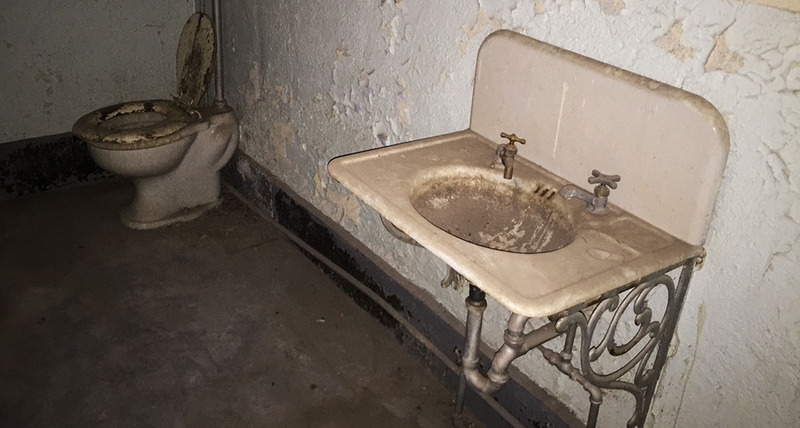 For two more decades after that, the facility struggled with substandard conditions. Finally in 1979, a new prison was built a few miles away and the inmates were moved over. Here is a picture from the early days of the prison. 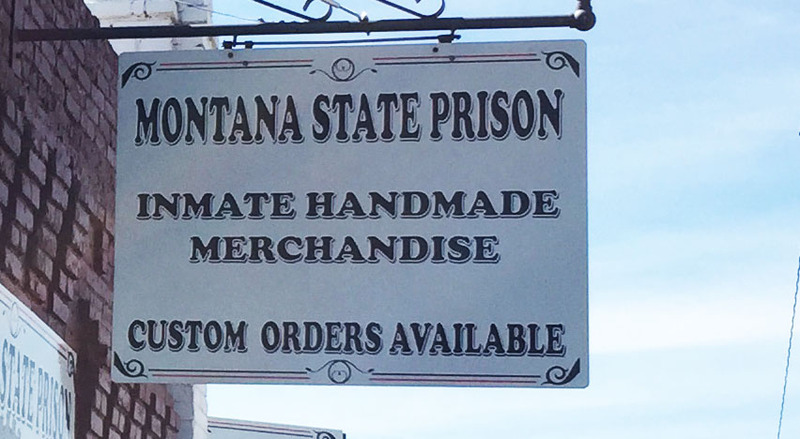 The first thing dad and I did was visit the “Hobby Shop” across the street where merchandise that has been created by inmates is sold. There were a lot of leather goods, some paintings, and other arts & crafts. Each item had a tag tied to it with the handwritten name of the inmate who made it. We didn’t make any purchases. 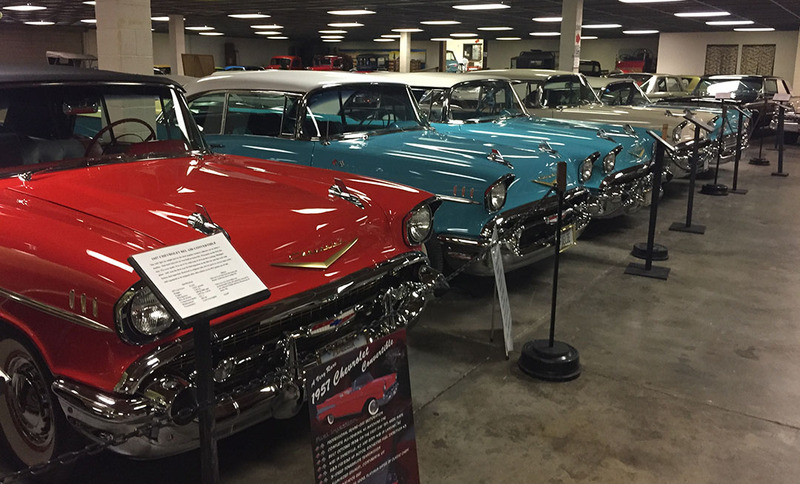 Next, we walked across the street to a 100+ classic car exhibit in a building next to the prison. Finally, we entered the prison itself for our self-guided tour of the grounds. There were 20-someodd points of interest in the small leaflet the cashier had given us, and we saw most of them. 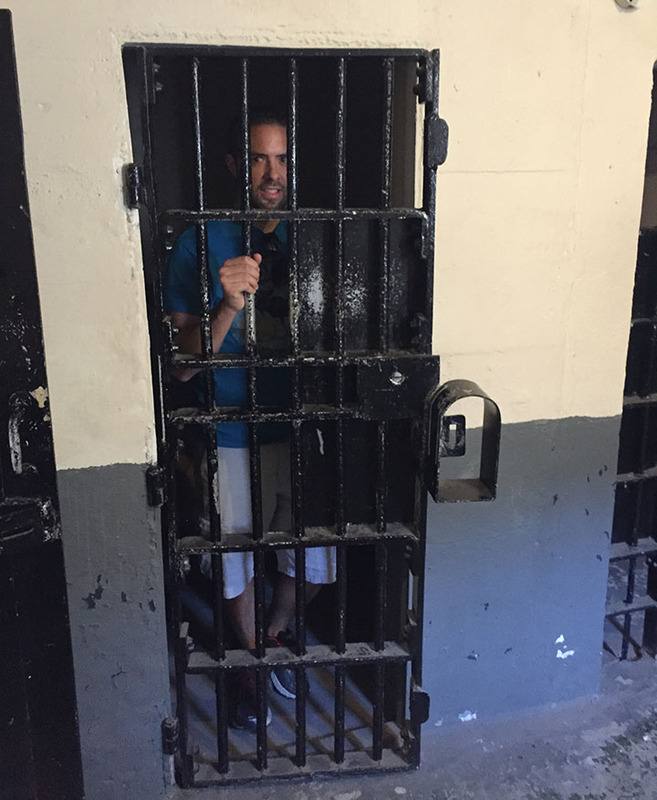 Most of the cement cells were depressing to look through – tiny showers, dirty toilet facilities, huge metal doors that took a lot of effort to open & close. 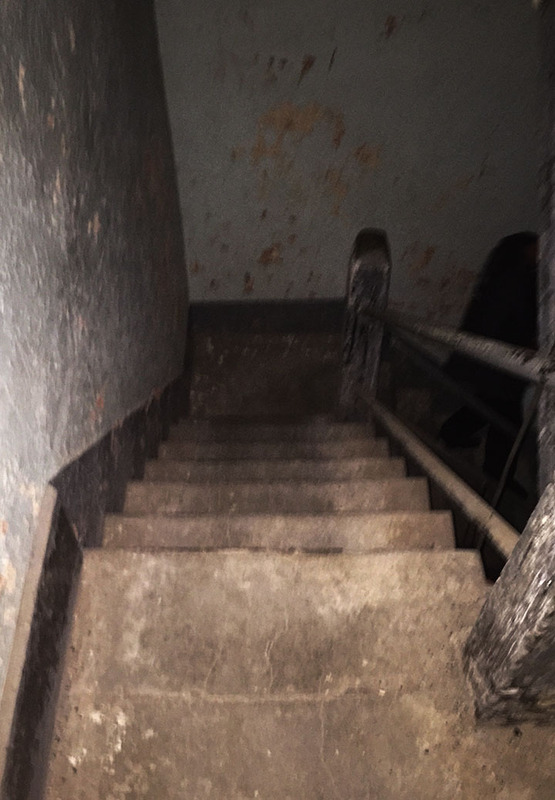 The coolest part was walking up through several flights of stairs that were pitch black until I turned on the flashlight on my iPhone to guide me. It felt like a horror movie in the making. Plaster was coming off the walls and ceiling and there was an echo with each step I took. The last stop on our prison tour was a peek inside the Clark Theater, completed in 1920. In its day, it could seat 1,000 people. It was the first of its kind – no other prison in the country had a theater. Severe fire damage in 1975 left it almost to ruin. 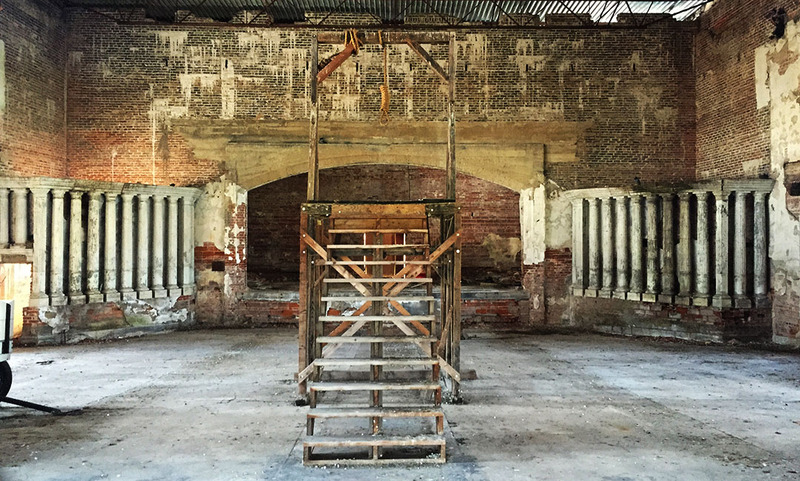 Today, there is a gallows standing in the center of the room where the seats were once lined up. That gallows was used in the execution of 7 men from 1920 to 1939. Notice that there were 13 steps leading up to the platform with a trap door – symbolic of the “unluckiness” of those who climbed them. 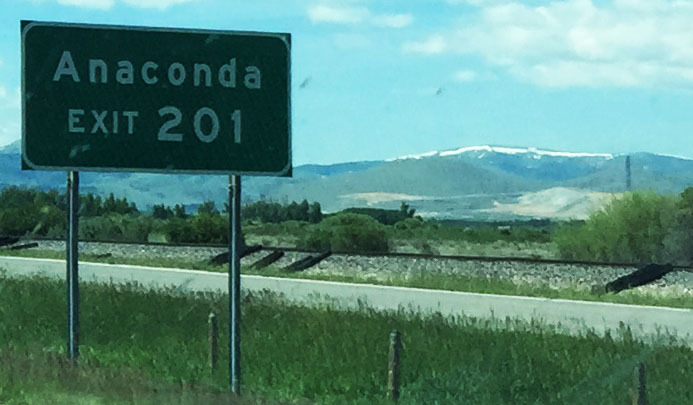 Look in the right hand side of the below picture at Exit 201 for Anaconda, Montana. You’ll see a vertical tower in the far background. That tower is actually a massive, 585-foot-tall smoke stack that was part of the Anaconda Company and built in 1919. 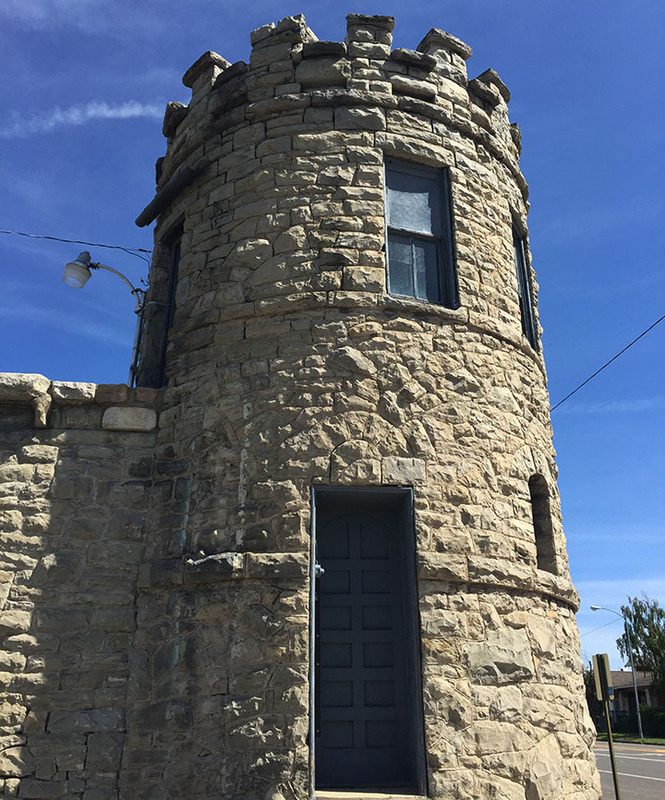 It is taller than the Washington Monument, and remains today as the world’s largest free-standing masonry structure. The surrounding buildings were demolished in 1981 after the plant closed, and now the area is a state park. Just before getting to Butte, we veered southbound on Interstate 15 from eastbound Interstate 90 and headed toward Idaho. 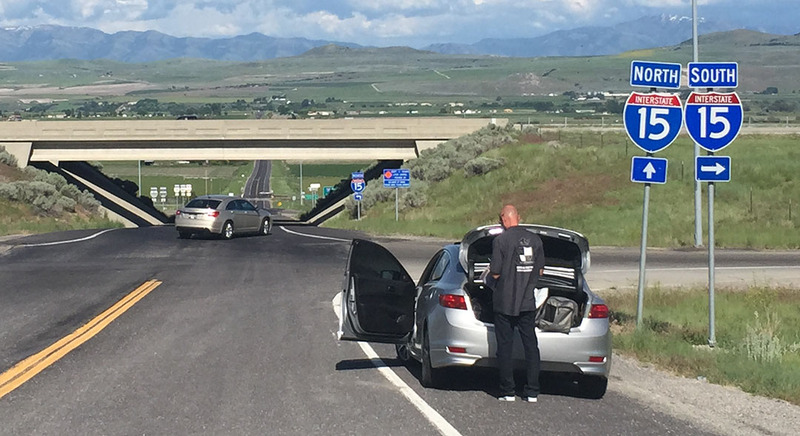 Once again it was time for some highway grub by the time we got to Dillon, Montana about an hour later. 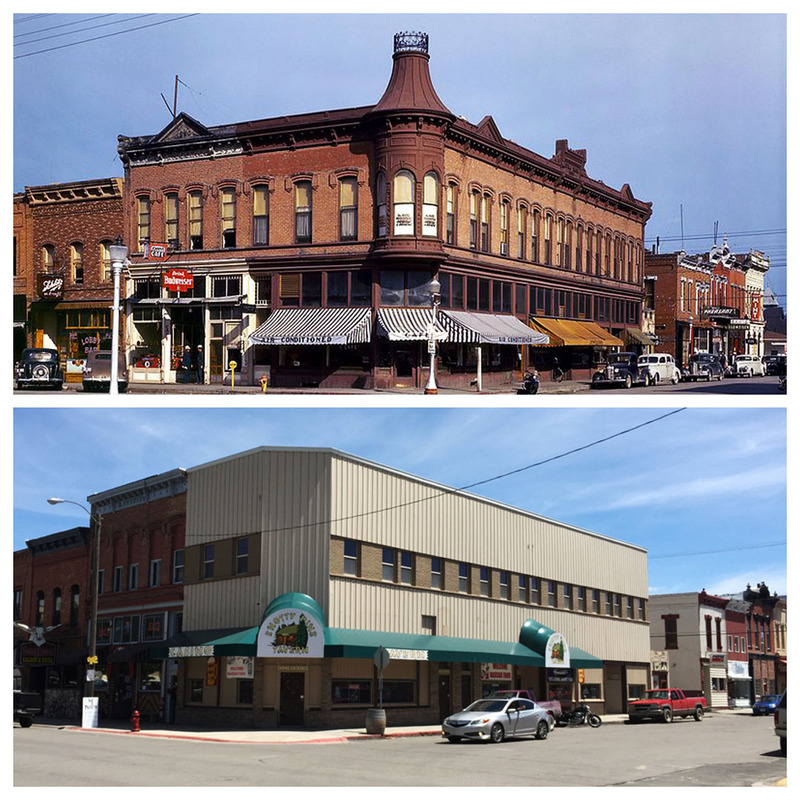 We decided to wing it on the restaurant choice and took Business loop through downtown Dillon toward what looked like a historic/commercial area. A few options jumped out at us and we went with a place called Papa T’s that was packed with a bustling lunchtime crowd. I happened to look up the Wikipedia page for Dillon, Montana while we were waiting for our burgers and the article had a historic 1942 picture of the intersection of Bannack Street & Montana Street. “Neat pic,” I thought. “I wonder if I could duplicate it?” So we had a mission after to dinner to find out exactly from which angle it had been taken. The good news: We found the correct location. The bad news: The neat 1940’s architecture from the historic photo has been replaced by boring siding, and most of the decorative rooftop woodwork has been removed. Even so, we got the picture we were after and I’ll post it here for your viewing pleasure. 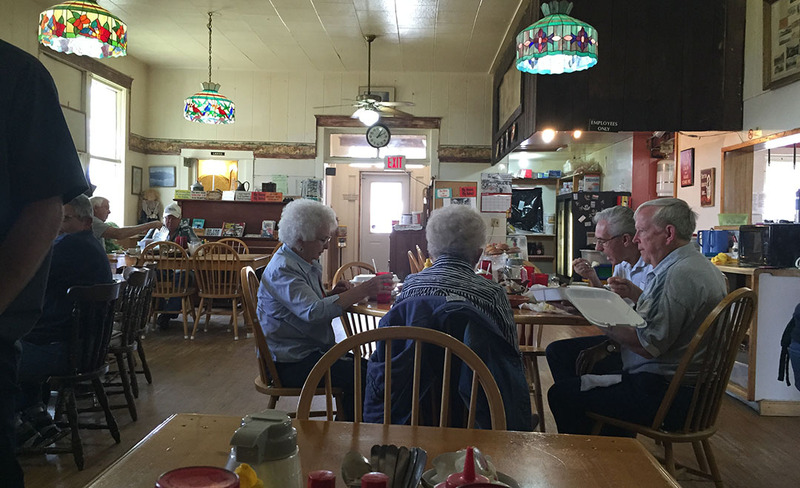 Even thought we were still absolutely stuffed from lunch, my dad insisted we stop at one more place for food a little ways down the road: Dell, Montana. Dell is really nothing more than a few buildings and a set of train tracks. But the one special landmark that’s been there since 1978 is the “Calf-A” restaurant. 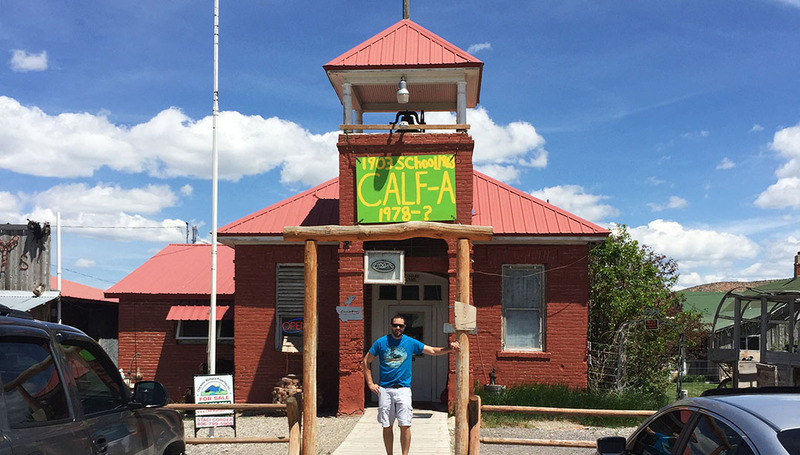 Calf-A occupies the building that was originally constructed in 1903 as a schoolhouse. The most popular items on the menu are the pies, and for good reason. I sampled the banana cream and it was amazing. I had dad take the wheel from there on out. 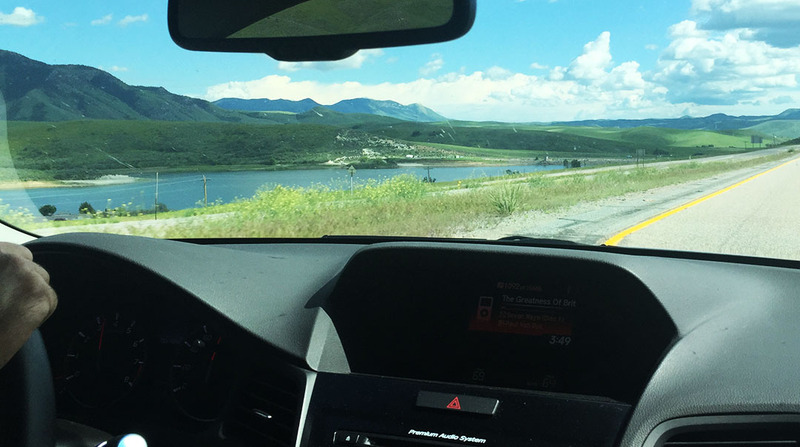 We crossed back into Idaho at Monida Pass (6,811) feet and continued on down I-15 for about the next 200 miles all the way through Idaho, stopping only once for fuel in Pocatello. My step-mom Tanya met up with us a little beyond the Utah state line and I said bye to my dad since he had to work the next morning. Meanwhile, I took the driver’s seat and continued southbound because I still had a ways yet to go before my trip would be over. I ended up plugging through all the way until St. George at the opposite end of Utah, where I spent the night at my brother’s. 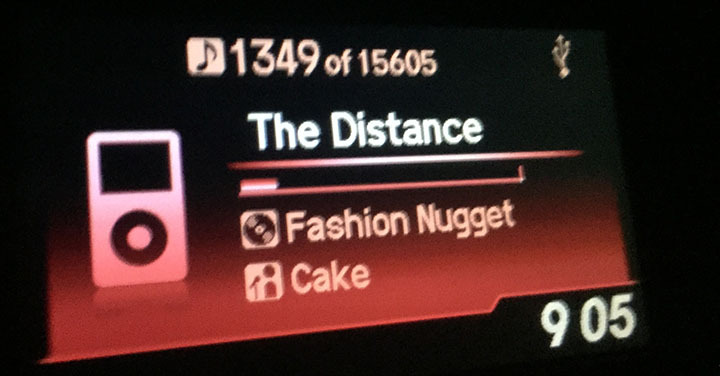 It seemed fitting when the Cake song “Going the Distance” came on my iPod a little after 9:00 p.m. (so, 10:00 p.m. Utah time) when I still had about an hour to go and I’d already been in the car for nearly 800 miles that day. I gladly called it a night at my brother’s place. Monday morning, I knew I had just one final stretch left. 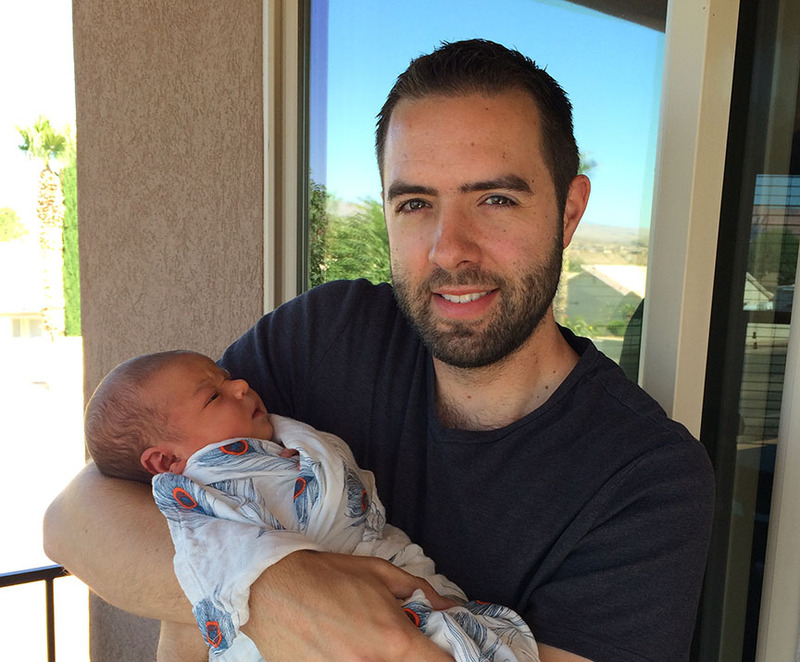 But before getting out of town, I paid a few visits including to my mother, my sister-in-law (where I met my 3-day-old nephew Locke), my grandpa, and my brothers. It was an incredible trip and I’m glad I was able to spend it with my dad and see some other family members along the way. Thanks for being a part of it! 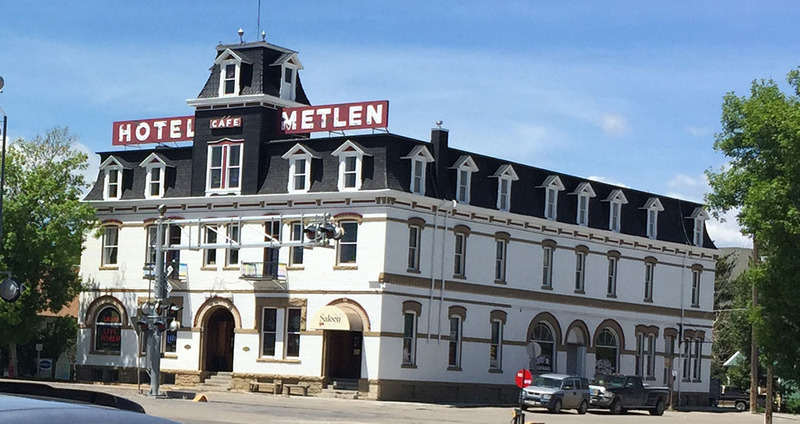 Historic 1897 Hotel Metlen in Dillon, Montana. It’s for sale! 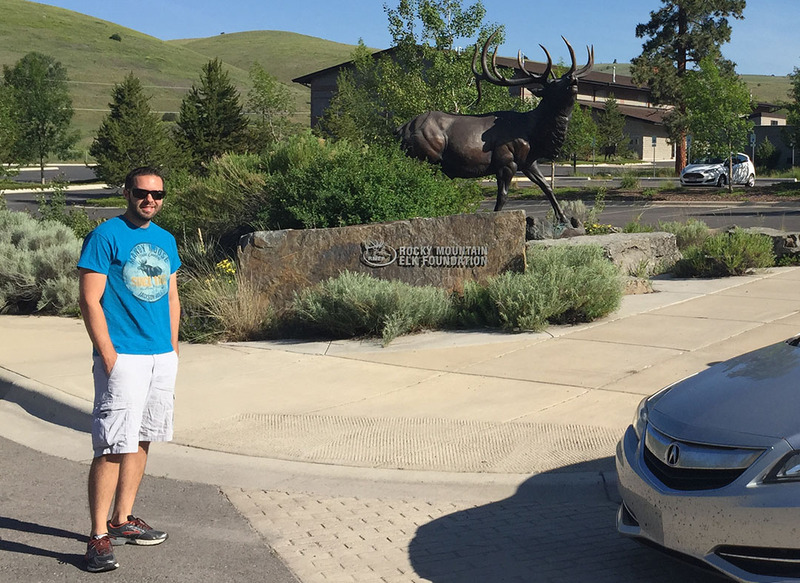 This entry was posted on June 13, 2015 at 8:08 am and is filed under ILX, Road Trip. You can follow any responses to this entry through the RSS 2.0 feed. You can leave a response, or trackback from your own site. Haha, I’m all about that high-adrenaline road tripping! Haha! Who knew there was an All-Wheel Drive Ford Tempo – that thing needs a rally course. Banana cream pie — my favorite! Lots of great pics and descriptions of the people and places on this adventure. Nice way to celebrate an early Father’s Day with your dad! Hope you’re enjoying the sunshine. We’re beset with massive rainstorms here lately, but at least the ducks are enjoying the back yard pond. There isn’t supposed to be a pond…. Hey, you’re now the proud owner of lake-front property! Doesn’t that mean your home’s resale value went up a bit? This 3-part post is like a good book and hard to put down. I am sure Gma and Gpa Mc are living vicariously through you too, taking trips to parts of the country they may never see in person. It’s good that you had a one-on-one trip with your dad; a father/son bond is untouchable. See you in a couple days. Prepare yourself for another adventure, blog worthy! 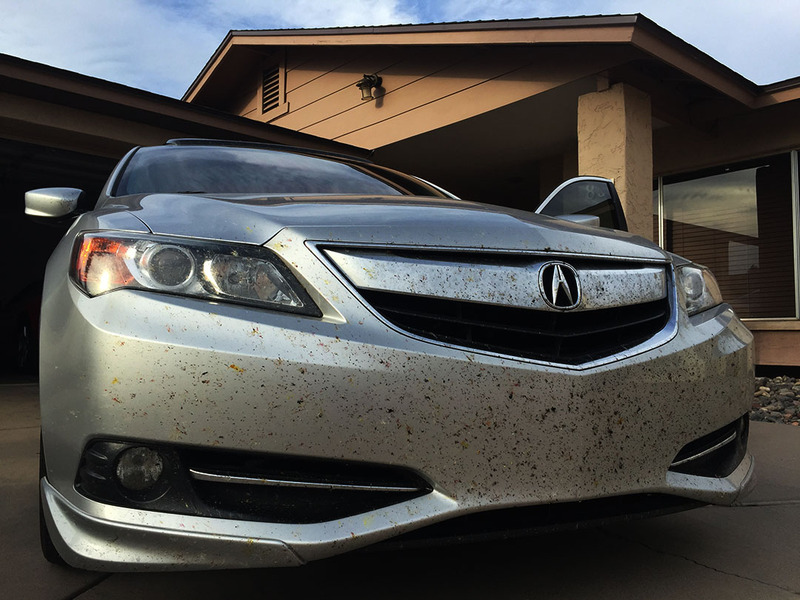 This might have been a record for # of bugs on the bumper at any time. Can’t stand to leave them very long. 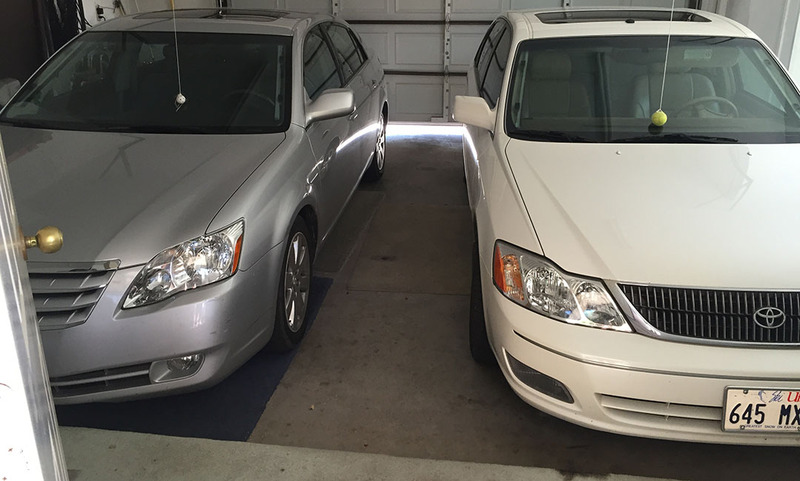 I had the dealership wash the car when I took it for an oil change last week, so they took care of the dirty work for me. See ya soon!